Earlier this month I took part in the Renuzit Pearls Scents Home Style Challenge. Basically I was given the chance to change up a area in my home that needed some tender loving care. I went through my home looking for spaces that could use a new look. I ended up in my bedroom staring at a dresser that I had recently repainted to better suit my bedroom color theme. To be honestly it was quite blah. I knew then that this was my project area. I went to my local TJMaxx and strolled through the home goods sections. I picked out things that I could place on the wall, and on top of my dresser to make it come together. I tried to stick to my color theme which is black and white. However I also wanted to add bits and pieces that would make me happy, and also be functional. Alright lets go through the goodies that I purchased at TJMaxx! HEART LOVE CANVAS - $19.99 | The first thing I knew I wanted to add was some sort of art work to the wall. I strolled through the canvas section and found this gem. It suited me in every way, shape and form. I love the positivity that it brings. Plus it matched well with my color scheme. And it will also match well with any future schemes I choose for my bedroom. NOTE PAD - $3.99 | One thing that was a must for me was a note pad. I cannot tell you how many times I will be in my bedroom at night, and something will come to mind. Groceries I need to pick up, things I need to look up, or any sort of ideas. Having a pretty note pad that is right in reach will help me write down my thoughts and know that I won't forget them! HARRIS BROTHERS CERAMIC SOAP TRAY- $5.99 | Why would I get a soap tray for my bedroom? Believe me I'm not going crazy here, they make fantastic jewelry and assorted item holders. I can put necklaces I'm going to wear in them, nail polish, lipstick, nail files... you name it. Anything that I use on a daily basis and want easy access to fits perfectly in this tray. CERAMIC DACHSHUND FIGURE- $14.99 | For those who don't know, I am a huge dachshund fan. I find them to be so cute and adorable. When I saw this piece in the store, I knew I had to have it. It just adds a fun little kick to my dresser, and makes me smile when I see it. After my shopping trip was over, I went to a few other stores to pick up a few small items that I wanted to complete the look. When I got home, I went right to work. 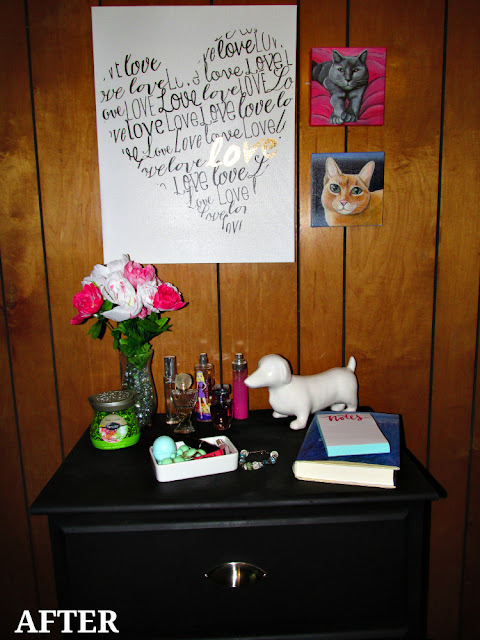 I also added in a few things I had in other places in my home that I wanted to add to my dresser area. I also had to add in the Renuzit Pearl Scents in Sparkling Rain to my dresser to keep my whole bedroom smelling wonderful! I also put the scent Blue Sky Breeze in my bathroom! They keep the area they are in smelling great, and are designed beautifully to match with any home decor. 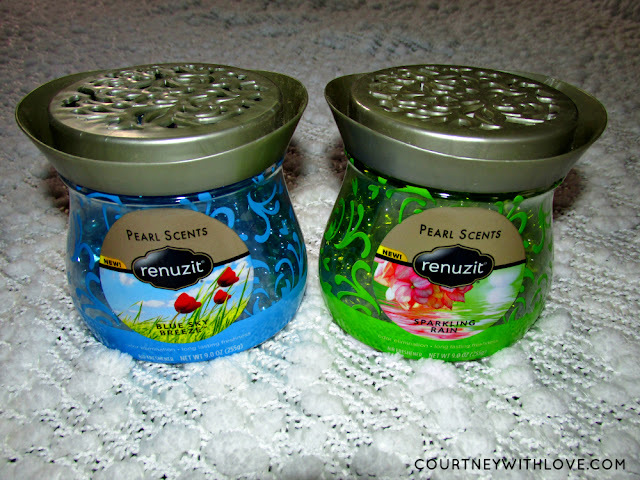 Stay tuned for a giveaway coming in June where you can win the chance to try the Renuzit Pearl Scents yourself! I will post the giveaway information when it goes live on my Facebook page and on Twitter! Alright, now for the reveal! 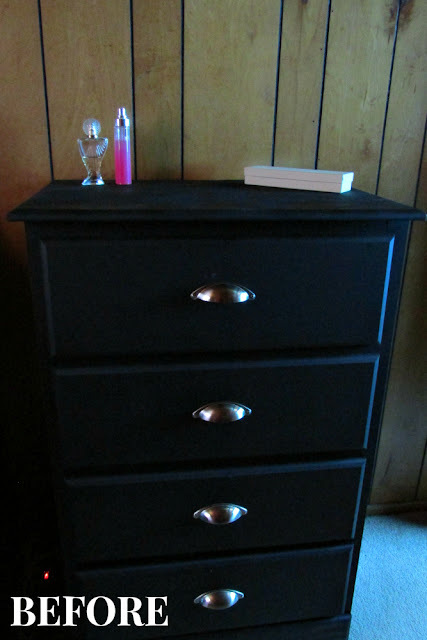 Below is my finished dresser area. Much more lively now, and it has everything that I love right in one spot in my bedroom. Now when I am in that area, I just feel joy. I added in some faux flowers in a vase with glass beads, the current book I am reading, 2 paintings of my 2 cats that was gifted to me, some of my jewelry and assorted goods, and my favorite perfumes. Dislcaimer: The Renuzit® brand supplied me with a sample of the Renuzit Pearl Scents and a TJMaxx / Marshalls / HomeGoods gift card to use for the Renuzit Pearls Scents Home Style Challenge.